LiveCode LessonsLiveCode LessonsHow To - Step-By-Step Guides To Tasks In LiveCode Using GraphicsHow do I Create Animated Overlays? This lesson shows you how to create stationary animated overlays. An animated overlay, also known as a sprite, is a confined graphical object that changes its visual appearance as a result of cycling through a sequence of graphical updates or as a result of external influences. For example, a sprite could represent an airplane with flashing lights on the wings. These lights would be animated to flash repeatedly in an indefinite loop. The behavior of a sprite may be environment dependent and change, for example if the airplane prepares for landing and the landing gear is displayed. This lesson shows you how to create two sprite objects. One cycles through a sequence of images in an indefinite loop, the other changes the image display based on button inputs. The image sequence in this step shows a space ship that is to hover and display a cyclic change of the lights below it. 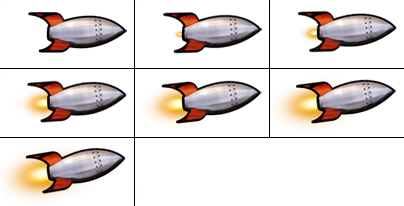 The image sequence in this step show a rocket in a number of boost stages. The elevation of the rocket increases with the size of the flame. To start an animation of any kind, first import the images that are to be animated. Select File -> Import As Control -> Image File... to open the File Selection Dialog. Then choose the images you would like to use in your sprites. You can select all of the files at once or you can select them individually. This loads the images into the center of the card. The images should remain on the card, as this allows them to be displayed faster, but they have to be moved to a region that is not visible to the user. Open the Property Inspector and select the Size & Position drop down option. You should be able to change the location of all images at the same time, if you did not move them after loading them. In this example, the images are located at position 200,200. Increase the value to 2000,2000, in order to move the images into a region that is not displayed. Drag and drop two push buttons onto the card. These buttons are used as vehicles on which to animate the sprites. Open the Property Inspector for the button that should display the space ship and select Basic Properties from the drop down list. Name that button "enemy" and untick all the check boxes, except for Visible. Select Icons & Borders from the drop down list and untick all the check boxes. Repeat the same steps for the button that should display the rocket, but name that button "rocket". You should find that the buttons are now not visible anymore. Drag and drop two push buttons onto the card. These buttons are used to start/stop the animation loop and boost the rocket. Open the Property Inspector for the start/stop button, name it "OnOff" and set the label to "Start". Then open the Property Inspector for the boost button, name it "Boost". // Pass the mouseStillDown message to the card. // as the message is not normally passed along the message path. The mouseStillDown message is called continuously at set intervals, if the button remains clicked. This allows you to detect if the user is boosting the rocket for a prolonged period with one click, rather than having to select a button repeatedly. The card contains all the code that is needed to animate the sprites. This includes global variables that store snapshot values of the animation, the commands that perform the animation, the message handlers that handle mouse clicks and the main scheduling loop that ensures the animation runs at the required speed and intervals. The variables maintain information that is relevant to each iteration of the animation. Data in these variables is updated by the animation commands and the button event handlers. // Set up local variables for current states of the animation. local sRun // The animation is running. local sEnemyImg // The sequence number of the current enemy image. // remaining before moving to the next enemy image. local sRocketImg // The sequence number of the current rocket image. // remaining before moving to the next rocket image. The global variables defined in the previous step contain information that is specific to an animation interval. This information is reset when the card is started up or between stop and start intervals of the animation. // Set up the default values for the environment. The mouse events are processed by two mouse event handlers. 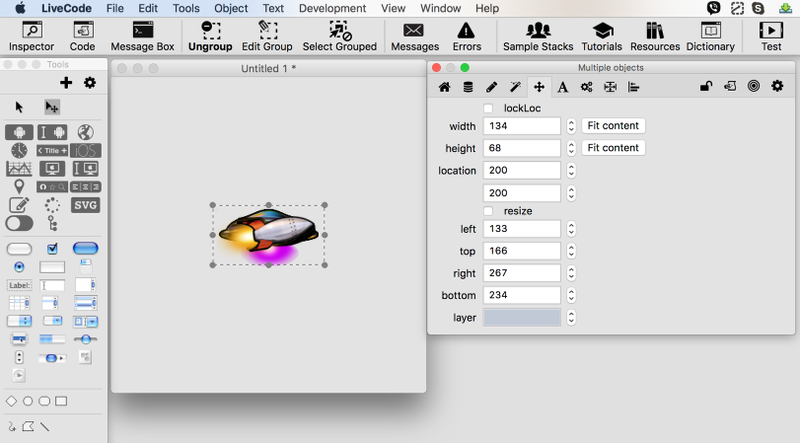 The mouseUp event handler processes button selections that start and stop the animation. // Handle mouse up events for the Start and Stop button. set the label target to "Start"
// Set the run loop to false. set the label of target to "Stop"
// Set the run loop to true. // Execute the main run loop. The mouseStillDown event processes the boost button and ensures that the rocket booster images are displayed in increasing order. // Handle prolonged clicks of the Boost button. // Increase the rocket image number. The space ship is animated by looping through a sequence of space ship images. Once the sequence has come to an end, the animation starts from the beginning. animateEnemy animates from one image to the next and does not run through all of the images at one time. The rate of image update is governed by the delay interval in the scheduling code and by the redraw interval count. This count determines after how many scheduling intervals the space ship sprite is updated. In this example, the space ship sprite is updated after five calls to animateEnemy. // Animate the enemy space ship. // drawing the next enemy space ship image. // once the last one has been reached. // Set the new enemy image. set the icon of button "enemy" to "enemy_" & sEnemyImg & "_.png"
The rocket animation is not automatic and depends on user interaction. If no interaction takes place, the rocket is not animated. If interaction takes place the rocket is animated, with animation taking place for some time after interaction stops. The animateRocket command also uses a delay interval and draw interval count to determine the rate at which rocket boost animations need to be updated. This value is set to 2, allowing animation changes to take place faster than they do with the space ship animation. If the rocket image index is greater than 0, draw the image and subtract 1 from the rocket image index. No more rocket image updates are made once the rocket image index reaches 0. // Allow for two scheduling cycles before drawing the next rocket image. // draw it and reduce the image index count. // We do not redraw the rocket if it is not firing. set the icon of button "rocket" to "rocket_" & sRocketImg & "_.png"
The animation is scheduled by a very short cycle. This cycle calls the animateEnemy and animateRocket commands, then waits for a specified number of milliseconds and calls mainEventLoop. The wait condition allows mouse button messages to be handled during the wait period, in order to catch start/stop and boost requests. // Continue this loop until gRun is set to false. animateEnemy // Animate the enemy space ship. animateRocket // Animate the rocket. // Delay further execution by 50 milliseconds. // But allow button clicks to be processed. Once you have implemented the controls and added the code, you should have something that may look like the image shown here. 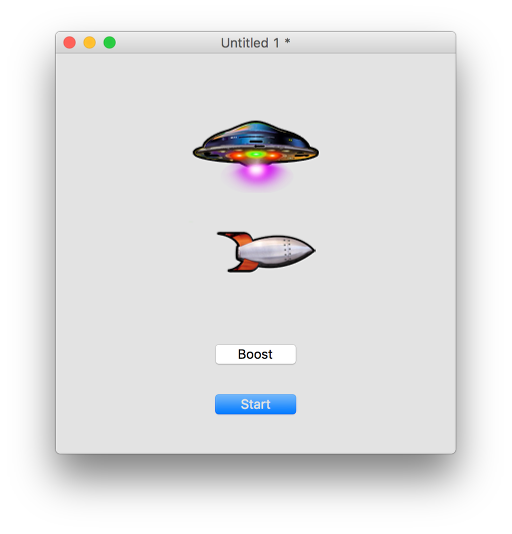 The start button activates the animation of the space ship and allows you to press the boost button that tilts the rocket and increases the flame from the rocket booster. If you would like to add motion to the sprites, then have a look at the lesson: How do I add Motion to Animated Overlays? Next: How do I add Motion to Animated Overlays? Thanks, for adding an sample stack. It always more helpful to have an sample stack to go along with an lesson. Great, but my need is different : i have a map with 95 regions inside. I want to change the region when the mouse rolls over it. I have made 95 images (same size with transparent background to get the 95 regions exactly size by side). I can roll over it and with the target, i can get which one I should change. But I do not find any way to change it. Do I have to use button instead, which means I would have to setup all the 95 regions by hand (position x and Y) ? if you can get the target, then you should be able to get the coordinates of the target. You could then place a new image in that location.